You may want to be familiar with the theory of the Faraday Effect and see what equipment you will be working with. Once you are ready you can use these procedures to investigate the Faraday Effect on the lab controls page. Because of the way diode lasers are constructed, they emit polarized light. You will determine the angle that the laser beam is polarized to before being rotated. Align the laser so it passes though the polarizing filter. Align the photorecepter and adjust the scale on the Vernier USB interface so that the lumination reads 770 lux. Adjust the ambient room lighting as dim as possible, and take steps to ensure that the lighting in the room will remain constant during the time you record data. Set the polarizer to 0 degrees. Record the light reading. Set the polarizer to 10 degrees, and record data. Repeat in 10 degree intervals. Plot the light intensity of the laser versus rotation of the polarizer in degrees. 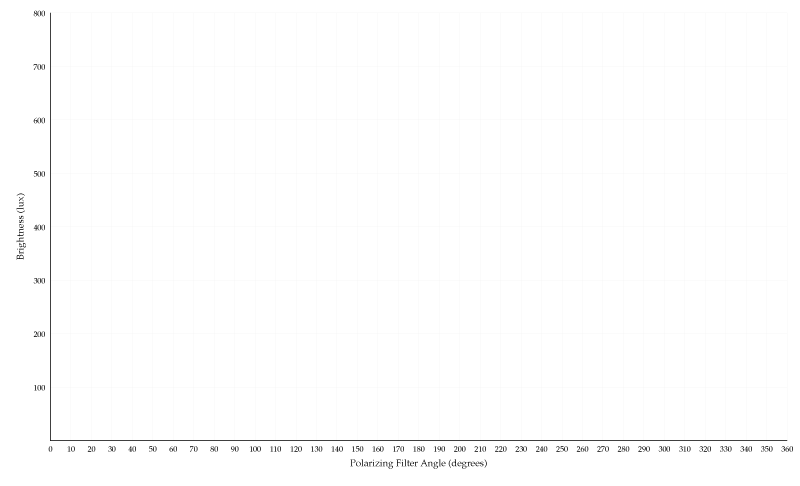 Blank graph to plot values of brightness versus polarizer angle. Larger, printable version available. From the graph, at what angle(s) are the brightest readings taken? What simple function does the graph look like? What would you expect the graph (and your data) to look like if you rotated the laser on its side? Because of the nature of the data, are there certain angles of rotation that are more interesting to observe than others? Why? Using braces, or a rotator for the laser, rotate it from its normal upright position by roughly 45 degrees. Carefully align the bean so it passes through the polarizing filter and onto the photometer. Again, starting with the polarizer set to 0 degrees, measure in 10 degree increments until you complete data points up through 360 degrees. Plot your measurements on the same graph as above. By how many degrees is the minimum point (dimmest) on the first graph shifted in the second graph? Suppose that you could not see the laser, but only measure the polarizing filter and the brightness via the photometer. Would you be able to tell the difference between the laser in its original position and it rotated upside down (180 degrees)? Why, Why not? What is the precision of your measurements? Set the laser to an upright position. Rotate the polarizing filter to 45 degrees and take a brightness measurement. Remove the filter from the path of the beam and take a measurement. Without rotating the filter, place it back in the beam and take another brightness measurement. Are the two measurements the same? How does the difference in brightness compare to your estimated precision? If your brightness level has changed significantly, what changed to cause the difference? What could you do to minimize or eliminate any differences during measurements? Measure the distance along the inside of the solenoid. Set the solenoid so that the laser beam must travel through its inside before hitting the polarizing filter. Connect the solenoid to a power supply. Adjust the current and voltage so that there are 5A flowing through the solenoid. With the laser in the upright position, and the polarizing filter at 45 degrees measure the brightness of the beam at the photometer. Turn the current off. Take the brightness reading again. What would you estimate the field strength (in Teslas) to be? Measure the length of the cuvette filled with olive oil. Place the cuvette inside the solenoid and ensure that the beam passes cleanly through, traveling to the polarizing filter and then to the photometer. Apply current (5A) to the solenoid and measure the brightness with the polarizing filter set to 45 degrees. Turn the current off and measure the brightness again. Was there any significant difference in the brightness measurements? If there is a significant difference in measurements, is a more complete data set (from 0 to 180, or 90 to 270) warranted? If warranted, measure the brightness from 90 to 270 degrees in 10 degree increments with both the field on, and field off. Plot the two sets of data points on a new graph. By how many degrees are the two graphs separated?